Camping with kids can be a little more difficult than if it’s just you and your significant other. 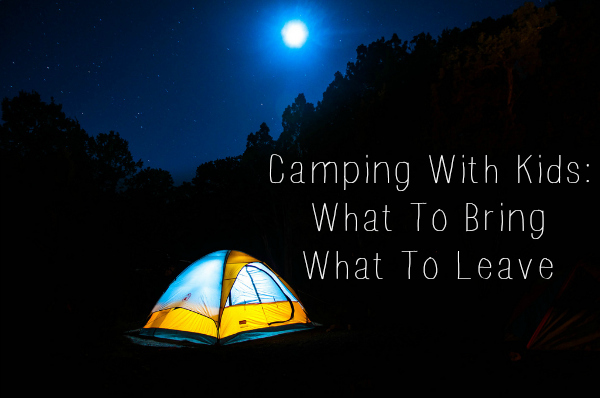 That’s why I’ve compiled a list of what to bring and what to leave at home when camping with kids along with some helpful suggestions for your future camping adventures this summer! Don’t be intimidated by how to go camping, it is really fun to get out and enjoy some time together in nature and away from devices! Do you know what to bring camping with kids? Hopefully, you already own most of this camping gear but if not you can find bargains by buying off season, second hand, or using coupons. Try outdoor stores and then search for coupons online. For this section it isn’t so much what to leave at home but all the excess that you can leave at home (bare in mind there will be things you need to bring according to your child’s needs). Excess; they don’t need to bring their stuffed animal collection or entire bedding etc. Try to pack an even amount that can be spread out for every one to carry. Now, if your car is going to be at the location of the campsite you obviously have more wriggle room of what you can bring but it doesn’t hurt to have a trial run of how heavy the bags or how full the car is. Wouldn’t be fun to hike into a campsite with lots of excess that you didn’t need! Plus, you’ll have a lot of grumpy kiddos! Toys: you don’t need to haul out your child’s play room for him/her to be entertained. Trust me, the whole part of camping is to experience a different form of entertainment. If your child would like to bring one of their stuffed friends, make sure they are small and can be transported easily. Electronics: These are just best to be left at home. You are guaranteed not to break or damage them if they stay home and your family memories will be filled with conversations at the fireplace instead of everyone on their iPads. Going camping with kids is not much different than when you go by yourself, significant other, or friends but making sure you have a few of the extra things I listed that keep the kids in mind when camping can be real lifesavers! When camping with kids, it is very important to have an “in case of an emergency escape route” etc. Familiarize not only yourself but the entire family with the proper outdoor guidelines. Also, when camping with kids, try to choose locations you are very familiar with and are easily accessible in and out. Don’t let any of this detour you from getting out and exploring nature with your little ones, as long as you are well prepared and are knowledgable, the experience will be fun and a great way to get away from the house! What have you brought in the past that later you found to you shouldn’t left at home on your camping adventures? Do you have any additional Dos and Donts to add to our packing list for camping with kids? Leave your comments below.